This section contains washable men's urinary incontinence briefs. HighTideHealth carries the top brands: Salk, HealthDri, Petey's, and Premier. 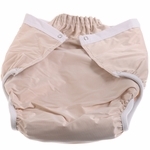 An economical alternative to expensive disposable diapers and briefs.